Mari Miniatt: Favorite vampires with pictures! Just where did some of the influence for Fledgling come from? Really I don't know, but I will share some of my favorite things that probably played a part. So here are some of my favorite vampires. Otto Von Chriek From Discworld, comes my favorite vampire iconographer. It takes a lot to be a vampire that likes to take pictures. Considering that every time the flash goes off, you turn to dust. Kain The main character from the Legacy of Kain video games series. I wrote about the game before. What is so great about Kain is that he is looking out for himself at all times. He knows he is being used and tries to find ways around it. Even if that means taking on a god. Vorador Another vampire from Legacy of Kain. Vorador was the first human to become a vampire. After the ancients lost the ability to have children. He is the oldest. He has the best mansion. Hints of a decadent lifestyle. And yet badass enough to kill most of the Pillar Guardians. He is also the most honest of all the characters in the game as well. You might not like what he has to say, but he is right. Dracula Of course Dracula would be on this list. If I have to explain to you why he is included, then go read the book, watch the movies, and see for yourself. D D from Vampire Hunter D. He is from the future where monsters run rampant over the planet and he is the best vampire hunter around. Technically half-vampire. When you figure out who his father is, you understand why he is so good at what he does. Alucard Vampire Assassin for the Hellsing Organization. Alucard is a great mix of European vampire myth and H P Lovecraft. Even though he uses guns, it is apparent that he doesn't need to, but he keeps his power in check. 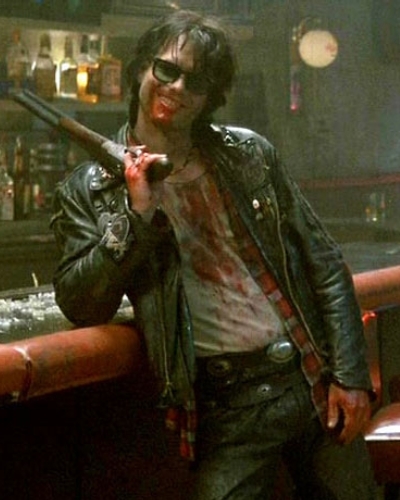 Severin From the movie Near Dark. Here is a vampire that has no problem killing you. He loves his life as a vampire and enjoys the destruction he causes. Eli from Let the Right One In. For those of you not familiar. Let the Right One is about a disturbed boy, Oskar, whos new, and only, friend is a young looking vampire named Eli. If you are thinking "Oh sweet, like Twilight." You are very wrong. Eli has found a way to survive, by forming dangerous and interesting relationships. Eli is a killer.Oskar and Eli have a lot in common. There are so many more. But as you can see, most of the vampires on my list, have no issue with what they are. They find their own ways to survive and not try to be something they are not.